The American National Standards Institute-accredited consensus standard ASCE 7-16, Minimum Design Loads and Associated Criteria for Buildings and Other Structures, is slated for publication in early 2017 with a user-friendly online version available for the first time. First, though, there is the question of adoption by the International Code Council. The National Association of Home Builders is opposing ASCE 7-16 over cost concerns. The measure will be considered during the Group B Public Comment Hearings at the 2016 ICC Annual Conference in Kansas City, MO, Oct. 19-25. ASCE 7-16 Chair Ron Hamburger, S.E., P.E., SECB, F.SEI, during a recent interview with ASCE News, discussed the importance of ASCE 7-16 and outlined what ASCE members can do to help in its adoption. ASCE News: Why is the new ASCE 7-16 standard so important? Hamburger: The 2016 edition of ASCE 7 incorporates a number of improvements over ASCE 7-10. Most important is the new chapter on tsunami loads. This provides the first comprehensive set of design criteria for structures in tsunami hazard areas, including coastal Hawaii, California, Oregon, and Washington. 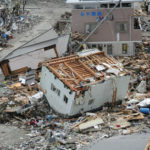 The committee has worked to develop these, cooperatively with National Oceanic and Atmospheric Administration and others since the disastrous Fukushima event in Japan. Other important updates include new wind hazard maps that reduce the wind loading and, therefore, cost of construction throughout most of the U.S.; new snow hazard maps that directly reference local snow data developed by regional SEAs [Structural Engineering Associations] in cooperation with state agencies; improved provisions for rain load design on flat roofs; updated seismic maps; and a completely rewritten, nonlinear analysis chapter for seismic loads. Also, there are numerous other updates and improvements to the standard, as well as correction of known errors and inconsistencies. ASCE News: Can you update us on the adoption process? Hamburger: ASCE submitted ASCE 7-16 for adoption by the I-Codes through an administrative update process that, basically, administratively replaces an existing referenced standard with the latest edition. At the code hearings in Louisville in April this was successful. The next step in the process is ratification of the committee’s action at hearings in Kansas City this October. Normally, ratification of administrative updates is done on a consent calendar basis, without specific discussion. However, public comments by the Asphalt Roofing Manufacturers Association and National Association of Home Builders have taken the adoption of ASCE 7 off the consent calendar. The comments request that the I-Codes continue to reference ASCE 7-10 rather than ASCE 7-16. At the Kansas City hearings there will be public comment, then a floor vote of government members of ICC who are present. Next, an online vote will be taken in November – again open only to ICC government members. The vote will be to uphold the committee’s adoption of ASCE 7-16. If the vote to adopt ASCE 7-16 fails, IBC-2018 will continue to reference ASCE 7-10. All of the maps and other design criteria will remain as they are in IBC 2015. ASCE News: So what can ASCE members do to help support ASCE 7-16? 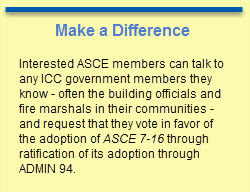 Hamburger: Interested ASCE members can talk to any ICC government members they know and request that they vote in favor of the adoption of ASCE 7-16 through ratification of its adoption through ADMIN 94. ICC government members are typically building officials and fire marshals. Most design professionals are not ICC government members and can’t vote. Read excerpts from Hamburger’s editorial in the September issue of Structure Magazine and see a list of organizations supporting the Structural Engineering Institute.